Email is one of the top ways to break through and secure meetings with targeted buyers. In fact, 80% of buyers say they prefer to be contacted by sellers via email. It's an essential part of any prospecting plan. However, too many prospecting emails fall victim to common mistakes that kill response rates. 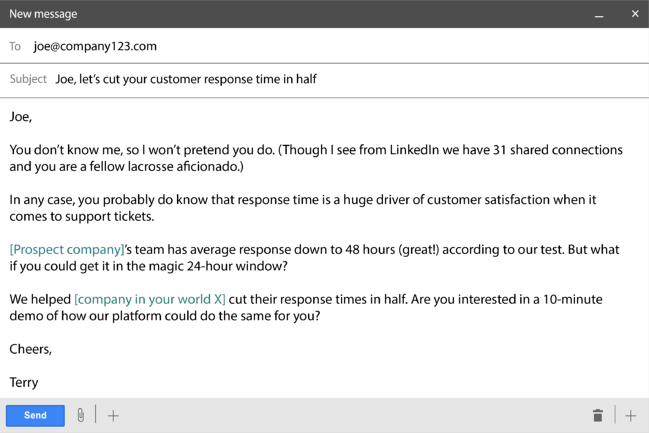 Recently, we shared 13 email prospecting best practices. Here are 7 email makeover ideas to help you improve your emails and work toward those best practices. Be a real person, not a robot. Lead with "You" instead of "I." Our platform features an innovative process for listing new openings across job boards, tagging, searching, and organizing job applications and resumes by utilizing cloud computing and decentralized information management. Candidates can be prioritized based on custom criteria and integrated seamlessly with your internal enterprise resource planning, which is a huge benefit to your business. You can post to 100+ job boards with one click and view all your best candidates in one place. We make it easy for you to screen and rate them, so you can make the right hiring decisions—fast! Small business owners see their top challenges as managing employee healthcare, dealing with government regulations, and diversifying their client base. Ask questions that prompt direct responses. Let me know if any of those times work for you. Is 9:30 or 1:30 a better time to speak? approach to [challenge]? Have you tried any of these strategies in the past? [related business value]. Are you currently working on improving [related business value]? Have one call-to-action (ask) per email and make it clear. I'd love to hear what you think of this video and find a time to speak with you about our latest research. I can also schedule a time to walk you through the demo and introduce you to my colleague in IT. I hope you enjoyed this video. I'd like to schedule a call to demonstrate how you can apply these findings with your team. Are you available September 4 at 10am? Subtle changes make all the difference in your emails. Give your prospecting emails a makeover with the suggestions listed above to start seeing dramatic differences in buyer response rates and increases in your sales results. 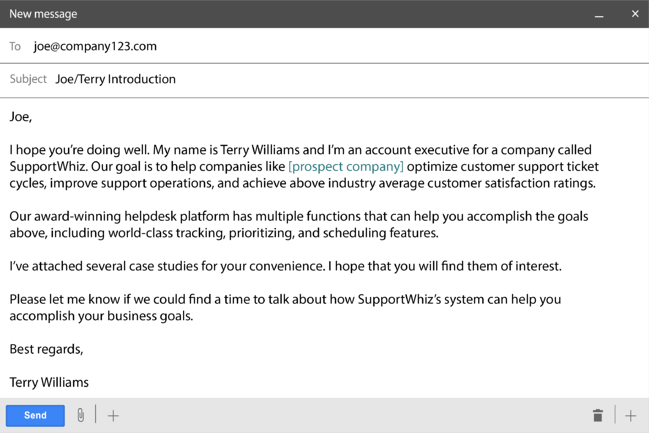 For more email prospecting tips and best practices, read: 13 Tips for Email Prospecting Success.